Your dashcam footage can help truck operators reduce crashes! All the larger fleet operators have by now invested in vehicle telematics and technology that helps them them to reduce costs. Vehicle telematics can tell the fleet managers whether there are excessive speeding, harsh braking and cornering and various driving behaviors that could lead to increased wear and tear and vehicle maintenance costs. This could also help towards keeping truck insurance premiums affordable as they are able to have a better claims experience/ record for traffic related incidents. The technology is also highly beneficial in the event of a traffic incident or road crash. The fleet manager can merely go back to the specific event and compare dashcam footage with other data to investigate what the contributing factors were causing the crash. It is however not only fleet operators who have some of this technology. Many motorists now have dashboard camera recorders installed in their vehicles. This footage can be used to report bad driving, as evidence in the event of a road crash , or to ensure that you do not become the victim of traffic corruption when pulled over! The Arrive Alive website received the following email from a road user on Wednesday 21 September at 19h03. This was also emailed to the email address of the trucking company. 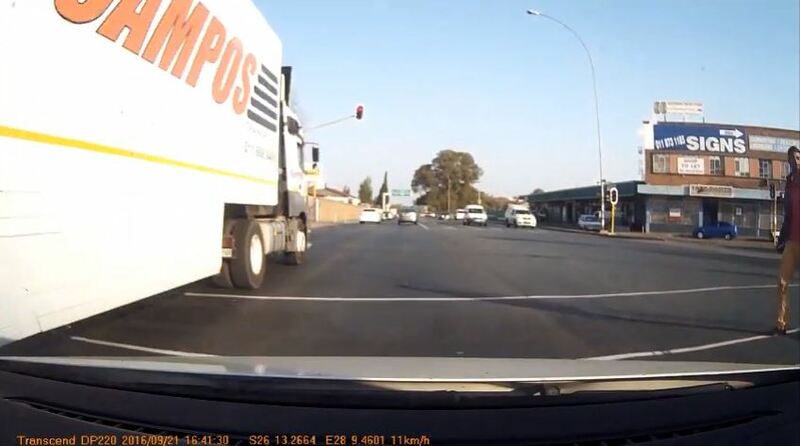 The value of sharing such an incident is that the trucking company in the absence of a traffic incident / crash may not have re-visited their own footage to view this dangerous traffic violation at the intersection. Having been informed of the incident they can also investigate their own data and dashboard recorder and use this in a disciplinary hearing. This may address the driving behaviour of not only a specific truck driver but also keep other drivers alert to the fact that the community is also keeping an eye on bad drivers!